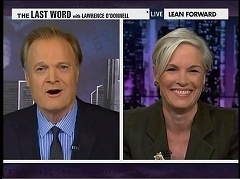 Cecile Richards, you now have my nomination for America's ambassador to the United Nations. Your artful diplomacy and how you have handled yourself in this relationship with your former partner who is now again your partner, the Komen foundation, has been something to behold. Cecile, when this broke out last week, I was in New York, and everybody I was talking to outside of the show - friends of Planned Parenthood and the Komen foundation - were absolutely outraged by this. I've been in Los Angeles throughout the weekend and today, and I can tell you, in Los Angeles, your friends - friends of Planned Parenthood - and friends of Komen still outraged. And there have been predictions that I've been hearing from people who are heavily involved in the funding of both of these organizations saying that they don't believe that Komen has long-term survivability now as a foundation.